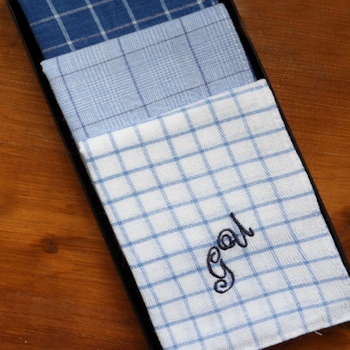 Three personalised embroidered mens cotton handkerchiefs - gift set of 3 assorted blue chequered patterns. Blue themed check pattern mens cotton handkerchiefs. Just fill in the option box with a name or initials and select a letter font style and text thread colour. Just fill in the option box with a name or initials and select a letter font style and text thread colour. Please note: the check patterns are assorted and may not be exactly as pictured. Size: 38x38 assorted check patterns.